Novalac Reflux is a premium infant formula that has been specially formulated to help reduce reflux and relieve the pain caused by acid regurgitation for formula fed babies. For many formula fed babies, reflux is a common problem that may cause your baby discomfort and may interfere with digestion. 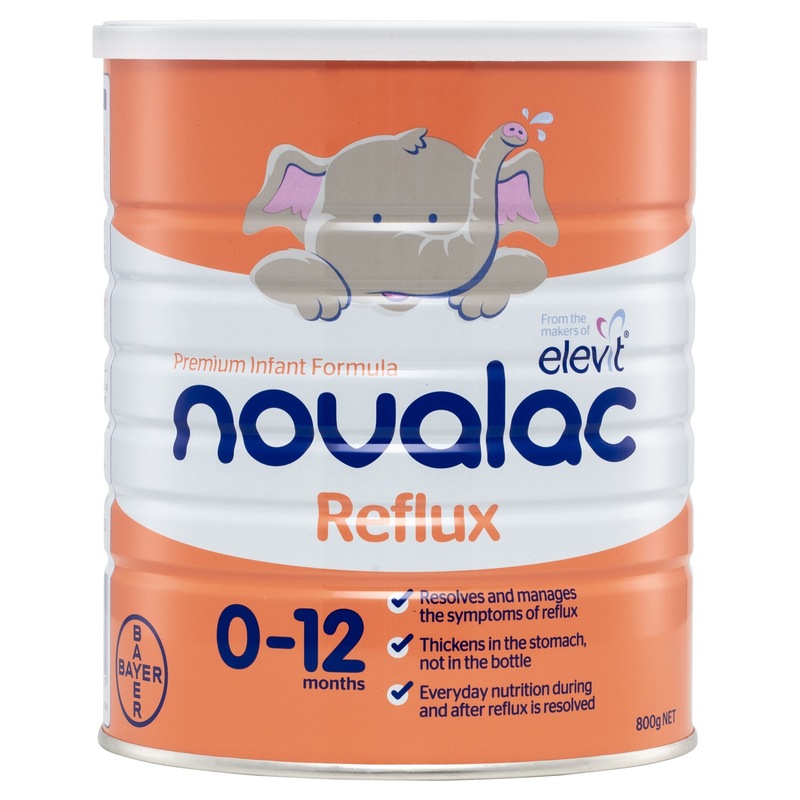 Novalac Reflux is a premium infant formula that is specially designed to help reduce the severity and frequency of regurgitation and may help reduce reflux helping to settle your baby. - For babies from birth to 12 months of age. It contains a special type of corn-starch that thickens in your baby’s stomach, helping to prevent acid reflux and aiding normal digestion. Unlike other reflux formulas, Novalac Reflux doesn’t thicken in the bottle, making it easy for you to feed your baby. Novalac Reflux is nutritionally complete and suitable for ongoing everyday use after your baby’s reflux has resolved. Breast milk is best for babies. Good maternal nutrition is important for preparation and maintenance of breast-feeding. Introducing partial bottle feeding could negatively affect breast-feeding and reversing a decision not to breast-feed is difficult. Infant formula should be prepared and used as directed. Social and financial implications should be considered when selecting a method of feeding. Please refer to the dosage and storage instructions on the tin. Skimmed cow's milk, lactose, vegetable oils (soy and palm), starch, emulsifier : soy lecithin, vitamins ( A, D3, E, K1, B1, B2, B6, B12, C, Niacin, Biotin, Folic acid, Pantothenic acid), trisodium citrate, tricalcium phosphate, choline bitartrate, magnesium chloride, taurine, potassium hydroxide, iron sulphate, anti-oxidant : tocopherols, zinc sulfate, inositol, L-Carnitine, copper sulphate, sodium selenite, potassium iodide, manganese sulphate. Refer to tin for full instructions and feeding guide. Use within 3 weeks of opening. Contents may settle. Store in a cool, dry place and protect from light. Use within 3 weeks of opening. Do not use after the 'Use by' date, which is on the base of the can. Novalac AR Reflux Formula 800g is rated 4.8 out of 5 by 17. Rated 5 out of 5 by Animil from Good product, does the job My daughter had terrible reflux. Our pediatrician recommended we try an AR formula so I tried this one as it’s made by the makers of Elevit so I thought it would be a reputable brand. It worked wonders. Within a week my daughter was like a different baby. She still has little vomits but she’s no longer in pain or screams during and after feeding. It’s lovely to see her so smiley after such an awful period where we didn’t know what to do. Thank you!